A major game breaking bug can be triggered during the Tribal stage, rendering a save game corrupt under certain circumstances. See save game data location. SecuROM PA DRM, serial key can be used up to five times. Use this tool to free an activation slot. Full game. Includes all the main gameplay features. Buy this for the full Spore experience. Limited version that only includes the Spore Creature Creator. Do not buy this if you want the full Spore experience. Contact the EA Support to activate any Spore keys on Origin. Does not use the SecuROM DRM. Retail version of Spore can't get the March 2017 update, so online functionality doesn't work. GOG.com, Origin, and Steam versions have this update. Contact EA support to activate retail spore keys on Origin. A limited free version of the creature creator from the game; can only be used to create creatures; does not include any other gameplay at all. All creatures created in this utility can be carried over to the full game. 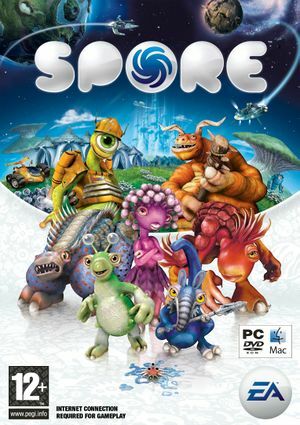 Spore Creature Creator and Spore should not be installed on the same machine at the same time. Existing save games may corrupt and other issues may arise. Adds new parts and animation to the creature creator. Expansion that adds new missions to the galactic stage. Add property playOpeningMovie (hash(playOpeningMovie)) bool at the end of the file and save. Add boolProp playOpeningMovie false at the end of the file and save. 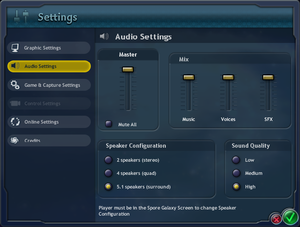 Repeat all on dataEP1 folder if you have "spore galactic adventure"
Allows the game's packages to be easily changed and modified. Contains a wide array of mods, which have been stored for archival purposes. A backup should be made before reaching the Tribal stage. Avoid saving the game, or evolving, while befriending any creatures, or the main save game will corrupt. 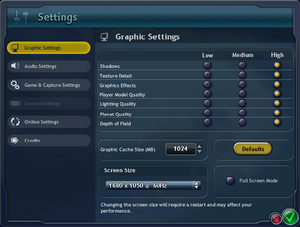 UI does not scale with resolution and is extremely small in 4K. Buttons have improperly aligned hitboxes. FXAA can be forced through the display drivers. MSAA does not always work depending on scenes. V-Sync can be forced through the display drivers. Now open the file ConfigManager.txt. The game will now run at 62 FPS instead. Change the integer value in ConfigManager.txt accordingly if you want an even higher FPS limit, based on the following formula: 1000ms / frameLimitMS = Max frames per second. For a more precise limit, set frameLimitMS to a value that allows the desired FPS (so if 120 FPS is desired, set the property to 8 to cap the frame rate to 125 FPS) and then use an additional frame rate limiter to force the desired limit. The default value of frameLimitMS is 33, for 30 frames per second. No decimal support. To compensate, use an additional frame rate limiter to force the desired limit. In its second stage (the 'tribal' stage), you cannot adjust the y-axis inversion of the camera control. Use the -locale:en-gb or the -locale:en-us parameter. After completion of the initial cell stage, the player is prompted to modify their creature for life on land. Immediately after the editor is exited, a cut-scene will show depicting the species migrating onto land. The player may skip this cutscene, but doing so may trigger a semi game-breaking bug where no trees are rendered on that save-game's planet, even after reloading the game. The only fix is to start a new save-game and to let the cut-scene play through. The fact that the game can be started from any stage and all previously created creatures are available for selection at the creation screen means this should cause little disruption. This bug can appear after installing Patch 1.04 or SPORE: Galactic Adventures. The fixes only affects all future names, any previous objects named BAD_DATA must be changed manually. Go into the folder <path-to-game>\DATA\LOCALE\EN-US\. Right click on the file named NameGeneration.package and click Copy. This fix is useful for languages other than English and you want to use your original Name Generator, or if you use custom random names. If you don't have it, download .NET Framework 3.5. Insert your SPORE disc into your disc drive. Go to X:\Spore\Data\Locale\, with X the letter of your disc drive. Copy the folder of your language and paste to your desktop, followed by a folder of any other language. Go into the copied folder of your language. Rename NameGeneration.package to whatever you want. In the first, go to the Mod tab, Open the NameGenerator of the other language, press Unpack, go to the Files tab, expand the folder named #0461227D and click on #0FD9C1E3.prop.xml. In the second, do the same with your NameGenerator. Within #0FD9C1E3.prop.xml is the information of the different names. Copy all the names in the file and replace the others. You can add your own custom names. When finished, go to the Mod tab, Press Pack on the second language NameGenerator and replace the <path-to-game>\Data\Locale\yourlanguage\NameGeneration.package with the new one. This fix doesn't invoke the Joker Badge. In the Space Stage, go to another Solar System that isn't yours (or another save game). You can rename everything in your own system EXCEPT your home world. ↑ 1.0 1.1 File/folder structure within this directory reflects the path(s) listed for Windows and/or Steam game data (use Wine regedit to access Windows registry paths). Games with Steam Cloud support may store data in ~/.steam/steam/userdata/<user-id>/17390/ in addition to or instead of this directory. The app ID (17390) may differ in some cases. Treat backslashes as forward slashes. See the glossary page for details.